The Wang River Cycle is an extended song cycle based on the Wang River Sequence by the T'ang dynasty painter/poet Wang Wei (699-761 AD). The sequence exists in two modalities, a set of twenty quatrains of poetry and paraphrases of a no longer extant, painted handscroll. The sequence's "subject" is Wang Wei's estate in the Wang river valley to which he often returned for solace and rejuvenation, away from the politics and proprieties of courtly life. 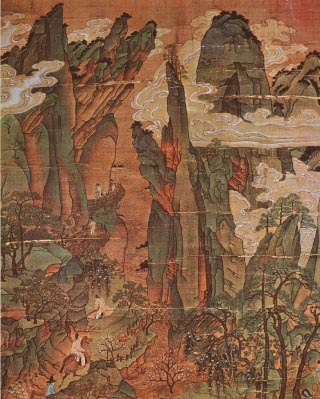 Although the original handscroll has been lost, the scroll's outlines have been passed down to us in the form of rubbing stones; there are also a number of Ming dynasty paintings based on the rubbings so we have some direct idea of the form, if not the style, of the original painted scroll. The poetry was composed in dialogue between Wang Wei and his friend, P'ei Ti, as the two walked through the river valley. At each of the various "views," each poet would compose a poem evoking the essence of the place. I came across the poems and handscroll paraphrases as a result of my interest in Chinese Buddhism whose aesthetics, metaphysics. and epistemology continue to resonate with my compositional concerns. Quite naturally, the intense and intimate quiet of the poems and scroll immediately suggested musical realization. While the poems are presented in a given order on the edge of the handscroll, I decided to set the poems according to their topological arrangement on the scroll. With the help of Chinese classics scholar Charles Wivel, I was finally able to identify the locations of the poems on the scroll. So my piece is also the record of a walk through Wang Wei's estate. Like landscape, the poems are not narrative or subjective. Yet along with their "suchness," they are full of allusions to earlier Chinese poetry replete with Buddhist and Taoist imagery. Without some appreciation of T'ang and earlier poetic forms, one cannot altogether appreciate their elegance. Nevertheless, much of their beauty survives time and place. To attempt to approach Wang Wei's mix of concrete temporality amid a web of reference--a very Buddhist kind of mix--I extended and generalized a certain category of (Western) musical structure known as a rotational array. While these compositional objects were invented by Igor Stravinsky in the late 1950s, the kinds of arrays I needed for the cycle were not easily constructed. In fact, I was not sure at the outset that some of the properties I had to have were even mathematically possible. Nevertheless, I was lucky and, with the help of a little mathematics and computer implementation, I found out how to construct what was needed: each array had to be harmonically saturated so that one array could embed in or reference another. In this way, the flow of vertical and horizontal harmony could match the intra/extra-referential contexts in the "sequence." While the cycle's heterophony, ornamentation, and slow temporal unfolding may suggest various kinds of East Asian music, I have not attempted to compose any kind of "World music." Neither am I interested in "translating" Buddhist thought or experience into "Western music." In any case, the attentive listener has every thing he or she needs to visit the Wang River. The composition is in eight movements, each featuring or omitting a different instrument of the ensemble. The harp has a special part in the cycle, as I associated it with the "lute" (the ch'in, actually a zither) in the poem, "Bamboo Grove House." Introduction; "Bamboo Grove House"; Coda. "Huatzu Hill"; Interlude; "Meng Wall Hollow". Introduction; "Apricot Wood House"; "Bamboo Hill"; Interlude; "Magnolia Park"; Interlude; "Dogwood Bank"; Chin song. "Sophora Walk"; "Deer Park"; "North Hill". Introduction; "Lake I"; Interlude; "Willow Waves"; Interlude; "Lake Pavilion". Introduction; "The Rapids by the Luans"; Interlude; "Gold Dust Spring"; Coda. "South Hill"; Interlude; "White Stone Shallows"; "Magnolia Slope". Introduction; "Laquer Garden"; Interlude; "Pepper Garden".